Oh man I got to reconnect with an old rando I buddied up with back in the day. We won a couple but lost a lot. Most of all we had fun and laughed at the mistakes. Good times. I didn't. Sitting at D3.3 all week. Then a real bad run last night dropped me back to d2. Out of town now and won't get to play for a few days. Many games later, but I also made it. Heck yeah! It was a good run! Congrats Disco. And official forum congrats to the Dorkman. It was a great night in Snow Day tonight! Good communication made all the difference. We lost very few matches and we were beating champs for a lot of it. Ran into a few GCs (from other modes) and beat most of them as well. Saw my first "RNG Champ" (which is last seasons Grand Champ Rumble title). We were all diamond at the start of the night and by the end Disco was champ 1 and Dork and I were champ 2. Meanwhile, with another "what a save" when I missed a save from my own team (a game we ended up winning), I disabled all chat including team only quick chat, and mapped the scoreboard button to something I don't normally press (select button on a 360 controller), and games have become even better. When I queue up (I usually do standard and solo standard comp), I don't even know which type of game I'm joining anymore! I do wish we could completely unmap the scoreboard button, but the game requires something to be mapped to it. I got to Plat 2 today. Feeling saucy. 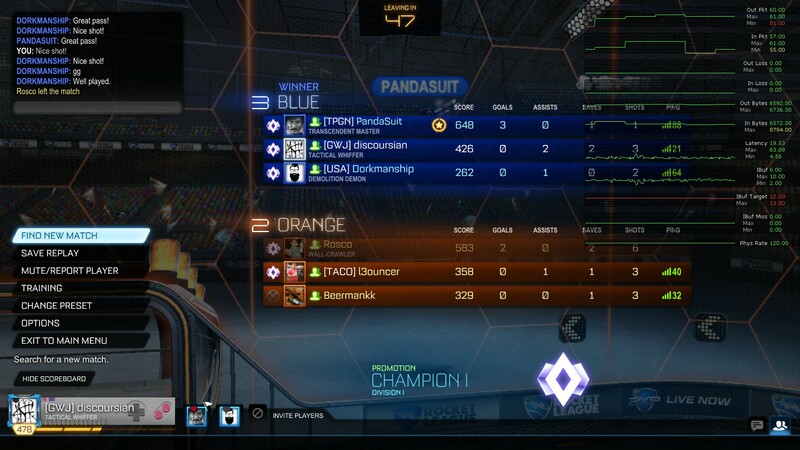 It wasn't that many seasons ago some of you were posting your first screenshots of getting diamond and now some of those same players are champ and some are very close to champ. I suspect we'll see at least a couple more champ screenshots on here before the end of this season and hopefully a bunch of other new rank achievements as well. The best part? It is just solid play getting you there, not flashy mechanics. No ceiling shots or air dribbles or flashy flicks. Just core Rocket League fundamentals and rotation done well. I still firmly believe the fastest way to rank up is to play with and against slightly higher ranked players. You just have to find those people and you ask them to play with you. The GWJ discord often has people playing most nights. The easiest thing you can do is probably reach out to one of the higher ranked players in GWJ and see if they'll play some. The Noobs discord has a mixer night every Tuesday that provides lobbies separated by rank. Join the one higher than your usual rank and meet some people. They also frequently have public matches going on every night with various ranks of players just playing casually together although those tend to be higher than average ranks and your mileage may vary. You can see what ranks are in a room by clicking on people in Discord and looking at the rank listed in their profile. I still firmly believe the fastest way to rank up is to play with and against slightly higher ranked players. You just have to find those people and you ask them to play with you. I think i've moved as far along on the "rank achieved" vs. "hours required to get better" graph as I'm going to go, and that's a combination of both skill cap and commitment time cap. Hopefully you don't forget about us as you leave us in the dust! I still like playing casual with you guys. The best part? It is just solid play getting you there,... Just core Rocket League fundamentals and rotation done well. I think these are both equally important. You don't have to be constantly grinding trying to actively improve your game. You really just have to be aware, in the moment, of what you're doing and make the proper adjustments. Rotations. Proper challenging (doesn't always mean since it was your ball, you should go. It means did your TM rotate back where it's safe to go for a ball you should be going for). Communication. There is no one, who we play with on the regular, who can't advance to the next stage. I echo the sentiments of those above. If you want to get better, there are plenty of ways to do it, and plenty of people to either help you, or get better right alongside you. No matter how you want to play RL, there's someone here who will be willing to play with you. I mean that is technically correct. haha. I'm just saying it takes almost no additional effort to do so... if you want to. Great, now who's gonna grind my coffee? I thought dork and I were going to chase champ together but we spent a lot of time getting in each other's way in doubles and losing the other day. We do good together in standard but our doubles playstyle just wasn't working. Hopefully I'll take another run at champ this month sometime. It might be time for me to take a break from RL. After being in plat 1/2 for the past 2 seasons I've fallen down to low gold 3. I'm going to play for a couple more days just to get to 100 on the rocket pass first though. It feels like the more I'm playing the worse I'm getting right now but maybe a little break will do me some good. When does the next rocket pass season start? This Rocket Pass ends March 18th. New one is probably early next month. Don't think they have announced a date yet. When I start to get annoyed by rank fluctuation I usually switch modes or I just play casual for a while. I don't want my frustration with rank loss to ruin my fun with the game. You can burn through your early rank reward wins in one of the non-standard modes pretty easy as you don't have to get your usual rank to get early reward wins. This season I decided I wasn't going to actively focus on standard or doubles at all and it has been kinda refreshing. When I start to get annoyed by rank fluctuation I usually switch modes or I just play casual for a while. I don't want my frustration with rank loss to ruin my fun with the game. I agree with this. I have a rule basically that says if I lose two ranked matches in a row, I quit. No problem. doesn't matter if I've won 10 in a row first (hasn't happened). Lose two and I'll call it and go find a new game to play or some TV to watch. Also, I can't tell you how much I appreciate this panda. You're clearly better than most of us, yet I rarely hear you get annoyed or frustrated. Just go out and have fun out there... whether I am not capable or I just don't care anymore, I just don't need the stress of trying to get guud in comp. Its why I play most of my ranked solo, and now more recently with all text off. I just want to get my diamond rewards and call it a day. Don't care if it takes me 40 wins or 400 (thankfully I only need 6 now). This Linkuru video reminds me of all the challenges I used to make up back in season 3 just for fun and practice. We would come up with some restriction on ourselves then play ranked with that restriction. Sometimes we'd play without boost. Sometimes we would refuse to leave our side of the field. Sometimes we would just never do aerials. Sometimes I would play the entire game from the wall. Sometimes I would play without using ball cam the entire game. They were fun to just mess around with and also helped us focus on getting good at specific things. It's amazing how fast you can actually play without boost once you get used to it. If you only play from your side of the field you have to get good at long shots. Playing without aerials forces you to work on dribbling. Playing off the wall is a very useful skill to practice. If you lose who cares as long as it's fun or you learn something. If you are worried about your rank do this in unranked or on an alt account and stop worrying about losing. Just challenge yourself and have fun. But, uh, don't do this in ranked with people who don't know you are doing it. It's best to go in with a full team that knows what is going on.